I'm keeping an eye on a storm the computer models have been advertising since the end of last week. It is more of a southern storm. 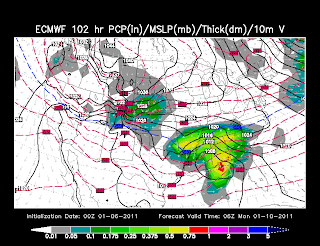 The southern storms are ones to watch for the KFVS viewing area as those historically have the largest snow potential. Right now the models keep the storm south. Maybe a little too far south for us to get a decent snow. However, one of the models brings the storm, and the associated precipitation, far enough north to bring some snow to parts of southeast Missouri, northwest Tennessee and maybe western Kentucky. The model that brings a little moisture our way is the European forecast agency's computer model. If you follow my blog you know that I am a fan of this model. It has also performed very well the last couple of months. 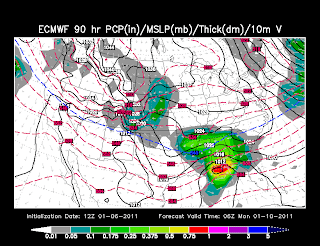 Here's a look at last night's 0z Thursday run of the model. We're looking at 12am CT Monday. The model takes the storm along the gulf coast. Notice the precipitation shield. It is rather large. In general terms look at the blue 540 line and figure anything north of that line would be snow. This run of the model indicates a pretty good amount of snow for central Arkansas and areas towards Memphis. This would also bring a little snow, perhaps 2"-4", through northeast Arkansas, the Missouri bootheel, and northwest Tennessee. 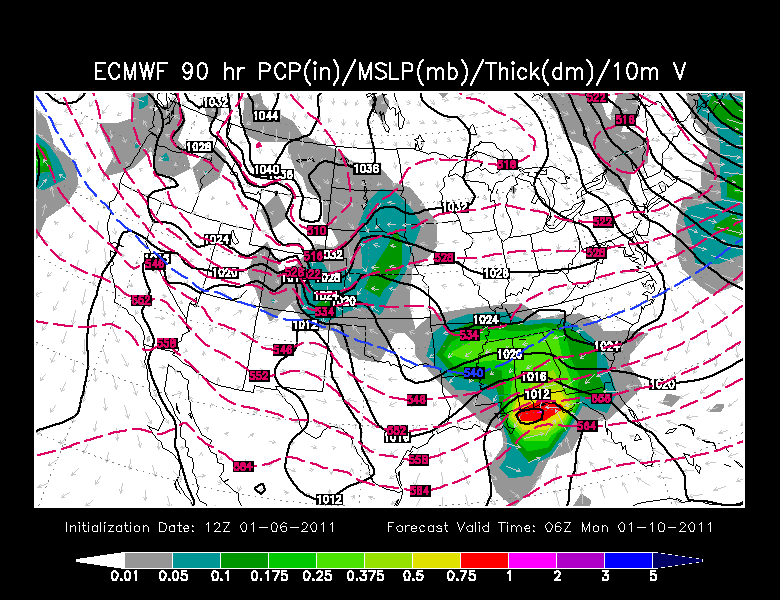 Here's a look at the new 12z Thursday run of the model looking at the same time, 12am CT Monday. This morning's run continues to keep the center of the storm along the gulf coast and spreads precipitation north of the surface low up through Arkansas and Tennessee. 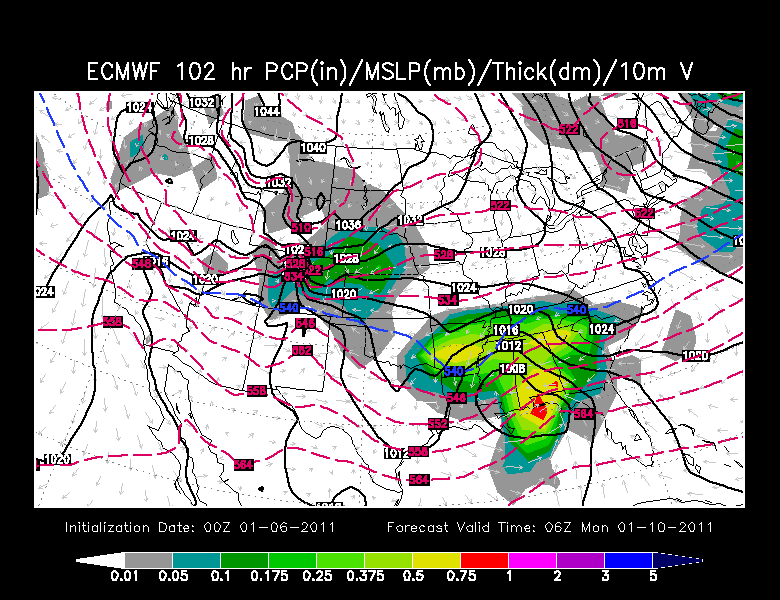 This would bring a little snow to northeast Arkansas, the Missouri bootheel, and western Tennessee. The latest run is showing not as much precipitation on the northern edge of the storm. So maybe 1"-2" of snow for the above mentioned parts of the KFVS viewing area. In contrast, NOAA's Global forecast model keeps the moisture south of the area bring at best snow flurries to the Missouri bootheel and northwest Tennessee. The one thing models agree on... the timing. They pass the storm by the area overnight Sunday in to Monday morning. This is far from a sure thing and is still a fluid situation. The numbers mentioned above aren't the actual forecast. They are just a quick glance number. I've got my eye on it and will provide updates over the next couple of days. As I like to say... Stay tuned.